I’ve been a sushi fan for some time now, and last year, I found myself eating it weekly at Sushi to Go in Parque Lleras, as well as the location on Avenida Las Vegas near my apartment in Envigado. While I was living back in the USA, I had the chance to eat some top-notch sushi at places like Blue Ribbon Sushi in New York City and Katsuya in Los Angeles. In particular, looking back at the photos from dinner at Katsuya makes me want to book a flight to LA pronto! Alas, I am living in Medellin, so I have to focus on what’s immediately on offer outside my door. 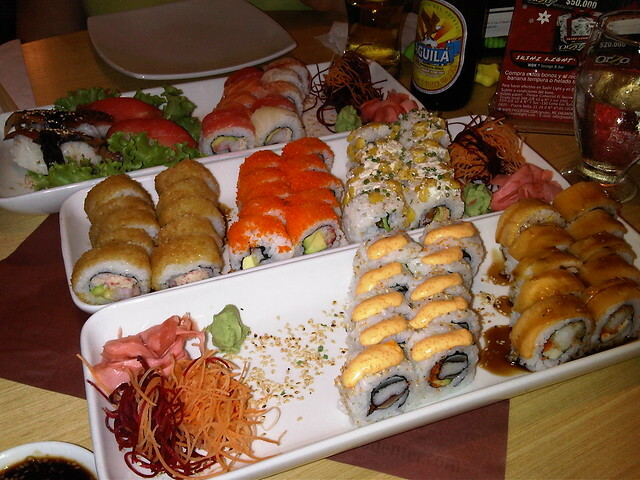 My first meal at Sushi Light in the new Centro Comercial Santafe was on a Sunday afternoon, after having bought a replacement BlackBerry. For some reason, I felt the desire to treat myself to a nice lunch despite having just coughed up a lot of money on a new phone. I grabbed a table with an expansive 180-degree view across the valley. The menu featured a wide array of Asian dishes. I ordered a roll, gobbled it up, and went home. Given the semi-outdoor atmosphere, and view, I knew it’d make a great place to take a date in the future. 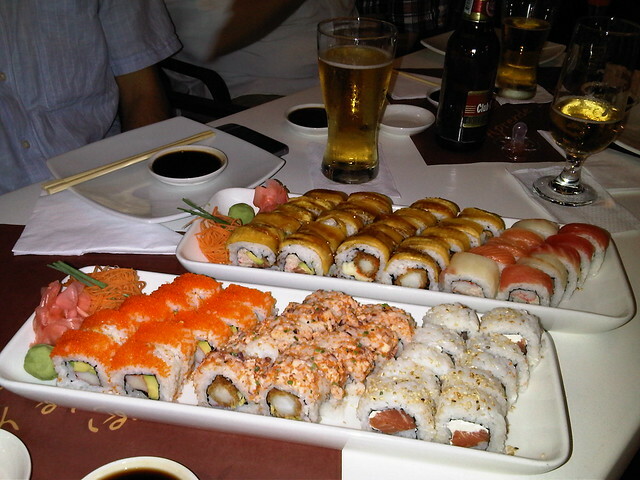 Tuesday night sushi and sashimi at Sushi Light. Two days later, I was back at Sushi Light for dinner with Troy, Christine, Drew and baby Cole. Troy was just getting into sushi, and we ended up ordering a lot. When the bill came, we were surprised to find it was far less than what we expected. As it turned out, we had just discovered (in our own inept way) that there was a special every Tuesday: 2 for 1 on most sushi rolls and sashimi, plus other dishes such as Thai-style red curry with chicken. The next day, after working on Christine’s video documentary at the botanical gardens, she offered to buy us dinner, so we all returned to Sushi Light, thinking we could get the 2 for 1 deal again. Of course we didn’t verify that discount was still on offer before we ordered a mountain of rolls. When we asked for the bill, we were taken aback at the regular cost of what we’d ordered. There’s no doubt we ate well, but we were also paying for it (Troy and I chipped in to ease the burden on Christine). Thankfully, the staff recognized our mistake, and in a sign of good will, gave us a 20% discount on the bill. A smart move customer service wise, as it would keep us coming back for more. And thus, in an effort to expand our sushi horizons, Troy suggested we make a weekly event of the 2 for 1 Tuesday special at Sushi Light in Santafe. We’ve been getting together to work our way through the menu ever since. Poseidon: Roll covered with spicy octopus, tempura prawns, kanikama (imitation crabsticks), cucumber and avocado. Cangrejo Blanco Roll: Fresh salmon, European cucumber and avocado, topped with white crab and a citric hash (akin to a fresh non-spicy salsa). Napalm: Surimi, avocado and shrimp; covered with panko (Japanese breadcrumbs), accompanied by sauce of eel and flambeed with orange liquor. Miami Hurricane: Shrimp, kanikama, masago (fish) and avocado. The regular price for a full roll is about 20,000 – 30,000 pesos or $10 – $15, so it isn’t cheap, however you can also order half rolls for a little more than half the price. Half rolls are a good way to try a greater variety of sushi if you have fewer people. In addition to the 2 for 1 deal on Tuesdays, they offer a variety of other specials on other days of the week. in Medellin you just cant find typic food. you also can find all kind of food like Chinese, Italian, Greek etc. the best place to go to eat are the Poblado, Envigado and Laureles because they have chefs experts to do each food. i think that if you come to Medellin . you are going to feel like in your house or country because the food have the same taste that in your country.